Colorful smoky eyes are so fun for summer, and blues are a perfect color for any brown eyed girl to rock. This smoky eye is so simple and vibrant and can be completed in 8 simple steps. 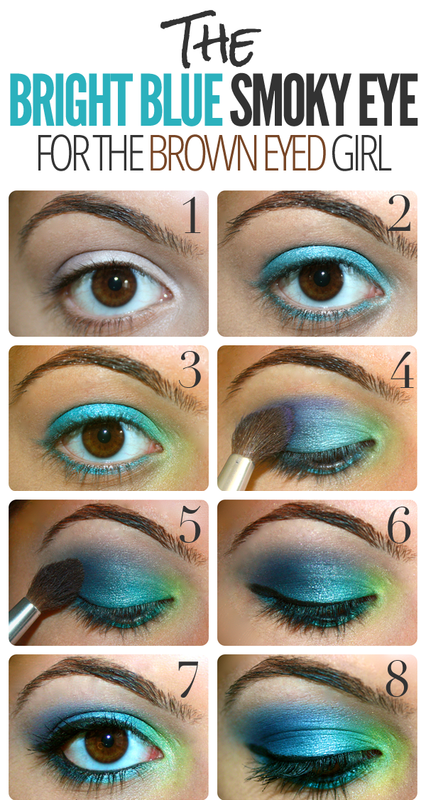 Enjoy recreating this mermaid-like, beach inspired smoky eye! Start off with a white base all over your eyelid and blend it evenly. White bases work to create a foundation for your shadows, making them much brighter and more vibrant. Use any cream eyeshadow or even a liner for this step. Apply a bright turquoise blue shade all over your lid, as well as underneath your lashline.Choose a blue that will pop, even after other shadows are blended over top. This color is the focus of your look and the brighter the better! Choose a yellow-based green color to highlight your inner corner. Focus this on the inner corner but work it into the blue color on your lid, as well as with the blue on your lower lashline. Lightly blend until the colors work nicely into one another. Take a blue based purple and using a blending brush, work this color into your crease. Blend it downwards into the blue shade so a gradient between the colors appears. Use windshield-wiper motions to evenly distribute the color among your crease. Be patient and truly blend out the colors for this step for the smokiest outcome. Take a deep purple or black shade and lightly tap this into your outer corner to add definition. Similarly work this color into the rest to ensure they work nicely into one another. Add black liner to your top lid using a liner brush. Use pencil liner to add black into your waterline, if you choose to. Finish off with 1 more coat of your favorite mascara and you’re ready to go!